Wilfred DVD Review This is off-kilter and occasionally off-colour comedy at its finest, and one of the most daring and memorable Australian sitcoms of the past decade. By now Wilfred’s simple yet decidedly effective premise will be familiar to most, especially with a US remake starring Elijah Wood having kicked off in the States earlier this year. It’s fairly neatly evinced in the series’ tagline: One Man. One Woman. And a bong smoking dog who thinks he’s human. The chap in the titular dog suit is writer Jason Gann, formerly best known for his work on comedy program The Wedge, and he proves a master of the deadpan as he growls his way from one howlingly funny line to the next. Also putting in a deft turn is co-writer Adam Zwar as the hapless love interest of Sarah (Cindy Waddingham, I Love You Man), Wilfred’s beautiful owner. Together the trio careen through life as the world’s most dysfunctional love triangle, searching for something pure in an increasingly chaotic world, or in Wilfred’s case eating pizza, smoking his homemade bong, watching DVDs, ‘rooting’, and trying to get rid of the increasingly annoying Adam once and for all. Wilfred is an endlessly enjoyable series, and it’s difficult not to be instantly charmed by its easygoing appeal. The premise is expertly played for laughs without being mined completely dry, and both seasons contain a near-perfect mix of clever writing and spot-on performances, bolstered by a number of excellent cameos (for my money the best is Stephen Curry as a giant talking cockatoo – I must’ve watched that scene fifteen times, sad as it may sound). 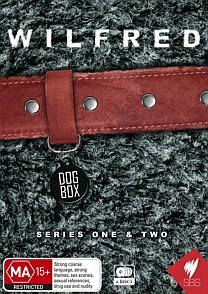 Wilfred even manages to find himself a love interest in the unlikely form of a feisty neighbourhood feline (played by Kestie Morassi, Wolf Creek) and flirts with fame as the star of a TV commercial (‘Dog Star’, Series 2). This is off-kilter and occasionally off-colour comedy at its finest, and one of the most daring and memorable Australian sitcoms of the past decade. No glossy, sissified HD here. The 16:9 transfer is quite grainy, particularly during the first season – the pilot is especially gritty. Picture quality tidies up nicely as the series progresses however, and at the end of the day Wilfred looks better a little rough around the edges. Both seasons features two-channel audio, which though a little rudimentary also proves perfectly acceptable – again, a big fancily immersive sound mix would be surplus to requirements, and the soundtrack on offer is more than up to the job at hand. The four disc ‘Dog Box’ doesn’t contain anything new in the way of bonus features, merely housing the previously released editions of Seasons 1 and 2 in the aforementioned cardboard receptacle. That said there’s plenty on offer in the bonus features department, some two hours worth, including a Making Of, Outtakes and Blooper Reels for both seasons, Behind the Scenes footage, trailers, ‘Wilfred Bites’ and much more.